Whenever a company outsources some task or project to another organization, they sign a contract. This contract specifies the term and conditions as well as a deadline when the project will be completed. During the project, both companies communicate frequently about the project and its progress. Upon completion of the project, the contractor informs the principal company about the work completed. The principal company may inspect the project outcomes and release the final payment to the contractor. 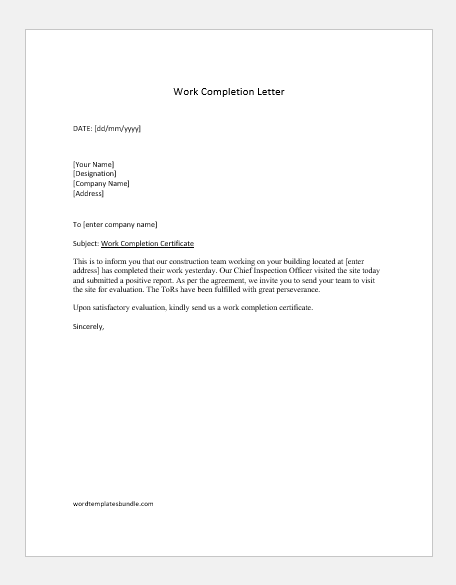 The contractor may write a work completion letter which is official proof that a project has ended. This letter is important for both parties as it notifies the principal company that the work has ended. The principal company may then issue a work completion certificate to the contractor. These are important steps in a contract, absolving both parties of the terms of the contract and neither is liable to each other anymore. Work completion letters are maintained in the files of the project along with other documentation regarding the project. 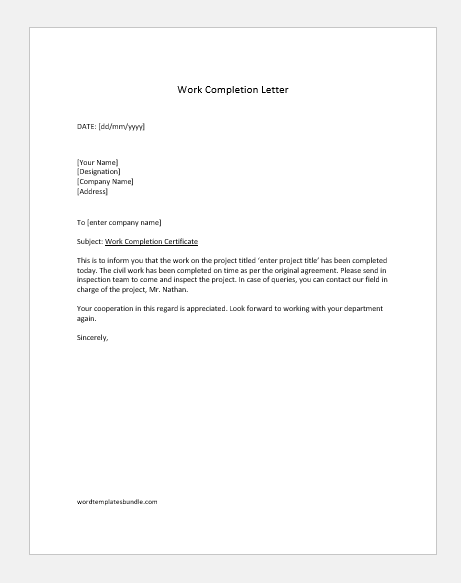 Work completion letters are mostly only issued when there are large contracts involved. You won’t find yourself signing a work completion letter upon getting the kitchen sink in your home fixed by a plumber. We are pleased to inform you that the project titled [enter project name] has been completed well ahead of time. It was due two weeks from now, however, owing to a qualified and hardworking team, we were able to complete the task in less time. Our quality assurance team has thoroughly inspected the work and given a satisfactory report. As per the contract details, we have complied with all ToRs. We have shared the report with you. You are welcome to inspect it and give your feedback within two (2) weeks. If there are any queries, we will be happy to answer. This is to inform you that our construction team working on your building located at [enter address] has completed their work yesterday. Our Chief Inspection Officer visited the site today and submitted a positive report. As per the agreement, we invite you to send your team to visit the site for evaluation. The ToRs have been fulfilled with great perseverance. 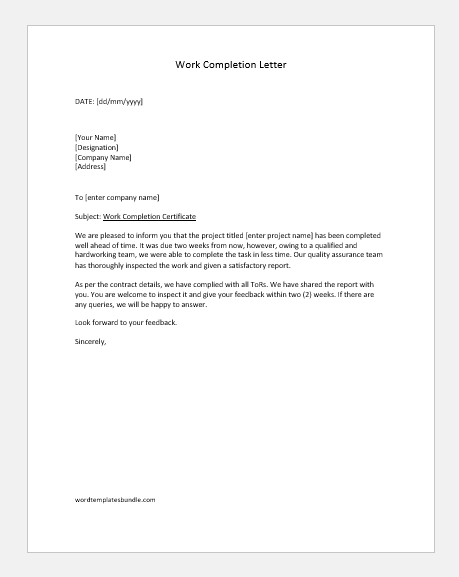 Upon satisfactory evaluation, kindly send us a work completion certificate. This is to inform you that the work on the project titled ‘enter project title’ has been completed today. The civil work has been completed on time as per the original agreement. Please send in inspection team to come and inspect the project. In case of queries, you can contact our field in charge of the project, Mr. Nathan. Your cooperation in this regard is appreciated. Look forward to working with your department again. This is to inform you that the maintenance work you hired our company for has been completed yesterday. The building has been renovated as per job description. There were several places where the floor had to be demolished in order to change the plumbing pipes. The floor was then revamped in accordance with your company’s demands. We invite your inspection team to visit the site and inspect the completed work. 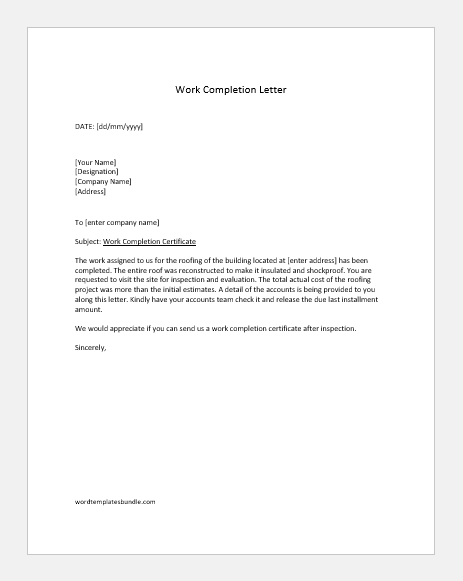 Upon satisfactory evaluation, we would appreciate if you issue us a work completion certificate. The work assigned to us for the roofing of the building located at [enter address] has been completed. The entire roof was reconstructed to make it insulated and shockproof. You are requested to visit the site for inspection and evaluation. The total actual cost of the roofing project was more than the initial estimates. A detail of the accounts is being provided to you along this letter. Kindly have your accounts team check it and release the due last installment amount. We would appreciate if you can send us a work completion certificate after inspection.